Performances taking place after normal business hours and/or on weekends, the Box Office will open one hour prior to the event time. Please note, Class Registration is available on Saturdays between 10 am and 2 pm at the Arts Education Program Office located on the 2nd floor of the Center. Please note class registrations are available on Saturdays in the Arts Education Office located on the second floor of the Center. All ticket sales are final, no refunds or exchanges. A $1 – $3 ticket processing fee is charged for all purchased tickets. From the North: Heading South on I-5, Exit 205 West towards San Francisco. Exit MacArthur Blvd., head South. Right onto 11th Street. Left onto Central to 715 Central Ave. Alternate Route: Heading South on I-5, Exit Tracy/Defence Depot/11th St. Exit, continue West on 11th, Left onto Central to 715 Central Ave.
From the South: Heading North on I-5, Exit Grant Line Road, head West. Left on Holly. Proceed South on Holly until it turns into Central. Proceed South on Central to 715 Central Ave.
From the Bay Area: Proceed East on 580, until it turns into 205. Exit 11th Street, head East. 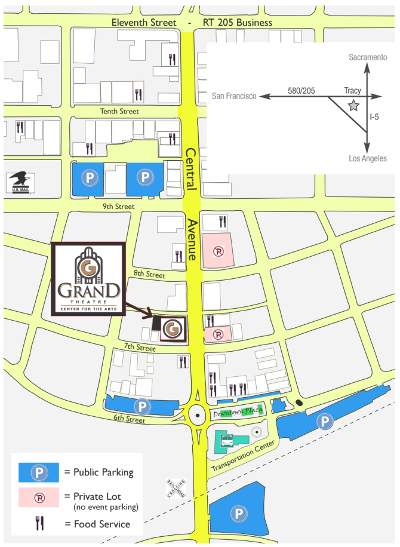 Right on Central to 715 Central Ave.
Free parking is available on nearby streets and public lots at 6th Street and Central Avenue. Patron drop-off and pick-up is available at the loading zone on Central Avenue. Please call ahead to address special needs. Specialized facility tours of all kinds are available. Please contact Patrons Services at the Box Office to schedule a private or group tour. Download the Tour Request Form. The Grand Theatre Center for the Arts is a non-smoking and drug-free facility. Large bags, balloons, large bouquets of flowers, and tripods will not be allowed into the theatre, but may be checked with front of house staff. During most events video recording is NOT ALLOWED. For most events the Don Cosé Arts Café is open, offering for purchase: PEPSI soft drinks, coffee, iced tea, water, popcorn and assorted candies. Select wines and beers are available for purchase for individuals 21+ with a valid ID, at many weekend events.